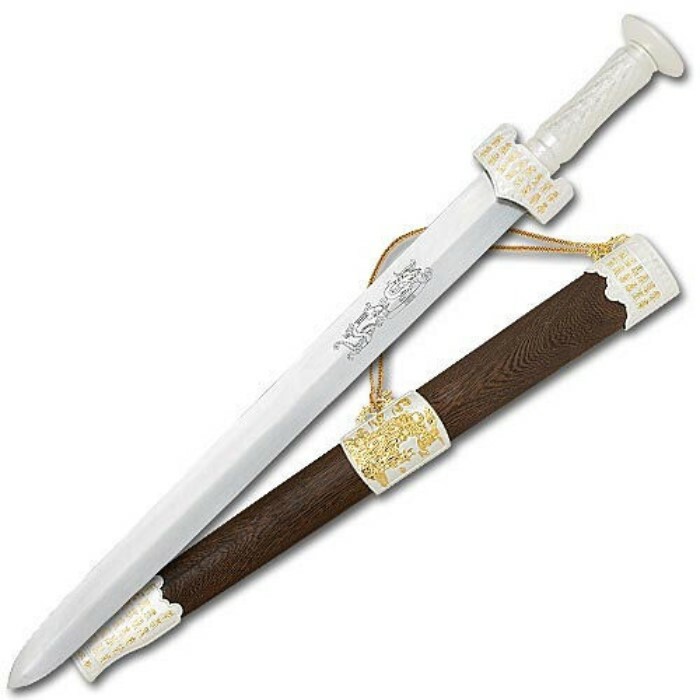 Sword of King Goujian of Yue | BUDK.com - Knives & Swords At The Lowest Prices! This sword is a handsome replica of an ancient item that was unearthed in China in the 1960s from the same area as the famous terra cotta warriors. The original sword was crafted nearly 2,400 years ago for King Goujian for Yue, a Chinese state that existed at the time. The blade showed remarkable construction and was relatively rust free, testifying to the advanced sword making skills of the Chinese. This superb recreation measures 29 1/2" in length and features a 22 3/4" stainless steel blade. The cast metal handle and pommel are richly accented in ornamental engravings. The coordinating sheath offers unique gold plated details and markings. This beautiful sword will be a central item in any historical collection!